Using water and steam engines to power factories in the 19th century was the start of the first industrial revolution, while electric power led to an even bigger change for mass production during the second industrial revolution in the early part of the 20th century. The third industrial revolution was brought on by the advent of the digital revolution, the use of electronics, and IT during the 1970's. Now, as we enter the fourth industrial revolution, companies are utilizing swift data collection, advanced information analytics, and highspeed network appliances to perform efficiently, collaboratively, and resiliently. Industry 4.0 is the technological evolution from embedded systems to Cyber-Physical Systems. It connects embedded system production technologies and smart production to the new technological age. Industry 4.0 represents a shift from centralized to decentralized product, which means that machinery will not only be able to execute simple instructions, but also accept multiple instructions. It will radically transform industry, production value chains and business models, and as well as assist the execution of a smart factory. The integrations of computation, network and physical processes are called Cyber-Physical Systems (CPS). Cutting edge technology with CPS means the elimination of the boundaries between the real and virtual worlds, making multiple innovative applications and processes a reality. Smart factories merge virtual and physical worlds through CPS as well as technical and business processes. In comparison with conventional production systems, smart factories provides significant real-time quality, resources and cost advantages. High levels of automation have now become standard in smart factories, which are made possible by a flexible network of CPS-based production systems. These types of Factories can fully customize products to meet the specific requirements. Thanks to the IoT, all components will be organically connected to each other in smart factories for an intelligent operating system. With the IoT and smart factory connectivity-production lines now have numerous advantages over traditional ones. For instance, if an incomplete product is on the assembly line, smart factory systems can detect what process it needs to undergo in order to be completed. In the past, industrial value chains had to implement product design, production engineering, execution, product verification and shipment separately. Now, Industry 4.0 technology can ensure that this processes can be accomplished at the same time. New, smart manufacturing processes will optimize plants and supply networks by transforming data into profitable values. Axiomtek provides a complete solution to overcome even the most critical challenges of industrial automation industry as well as providing support for customers who are setting up their smart factories with various requirements. Through the deployment of the eBOX embedded system series, we can increase production yield and factory efficiency while reducing cost burdens and the complexity of the physical inventory. Some of Axiomtek's eBOX series products can provide complete EtherCAT solutions, including high-end, entry level embedded platforms and RTX real-time software. The integrated EtherCAT master motion controller enhances performance and precision control. 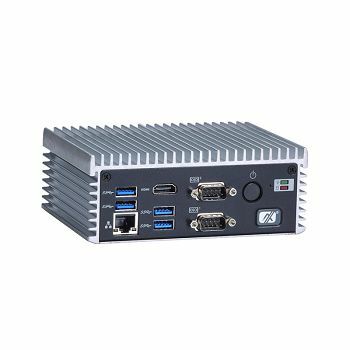 The eBOX671 series features 4 Power over Ethernet (PoE) ports and USB 3.0 ports, ideal for high-speed moving object inspection and related video surveillance applications. The system has many advantages that are suitable for smart factory applications, including a fanless design which means no more cleaning or replacing fans, IP40 rating, and noiseless design. This powerful embedded system can utilize its full feature I/O capability to manage various functions such as digital I/O, storage, peripheral devices, and the use of existing power management software to monitor the operational situations. 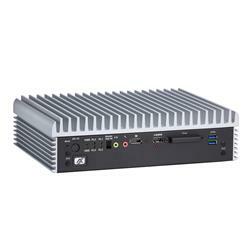 Axiomtek's eBOX series products offer x86 architecture platforms and are rugged with rich I/O options and fanless design. We provide various types of embedded systems and add modularization factor and network ability to improve the flexibility and the connectivity for our platforms. The user can select a suitable embedded system based on their specifications. 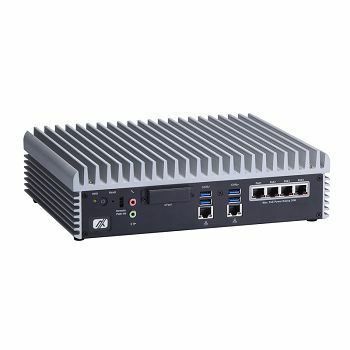 The eBOX expansion solutions offer a range of embedded systems with PCI and PCI Express expansion and all series integrated I/O including COM, USB, GPIO and GbE LAN. Both our high-end and low power levels series supports different user's demands to insert motion or vision cards, it reduces deployment and development time then setup the application quickly through this expandable solution.